You are here: Home / News / Welcome to my brand new website! Hello there & thanks for stopping by! If we haven’t ‘met’ before, then let me introduce myself. I’m a novelist who’s completely mad about archaeology adventure stories. It began when I first saw Raiders of the Lost Ark. I’ve been crazy about those kinds of stories ever since. There’s a kind of magic in getting lost in an epic adventure tale, forgetting all about the real world for awhile, escaping life’s worries. In addition to being an avid reader, I’m a big movie buff, too, and enjoy quiet times at home with my family and rescue kitties. If we have ‘met’ before, hi again! Thanks for being here. Your readership means a lot to me. 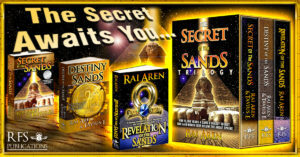 If you’ve already read & enjoyed The Secret of the Sands Trilogy, I’ve got some special bonuses coming your way that I think you’ll enjoy 🙂 Stay tuned! Cheers & happy reading always!